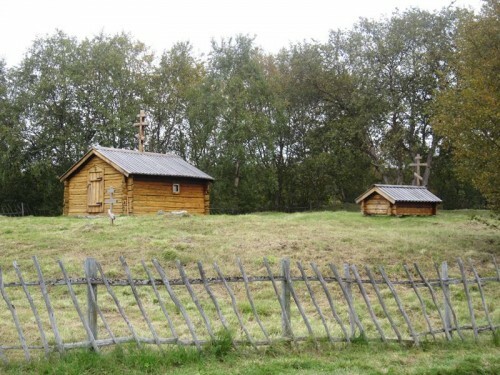 Orthodoxy in Norway has long had a Russian connection. In Viking times, various Viking chiefs and kings lived in Novgorod and contributed to making Kiev a cultural centre. Orthodox Saint Tryphon of Pechenga (1495-1583) left his native Novgorod in the early 16th Century, and spent the rest of his life evangelising the Skolt Sami of the border areas between Russia, Finland and Norway. Tryphon’s legacy is much evident in the far north. He founded the monastery at Petsamo and built several churches on the Kola Peninsula, notably the first church at Boris Glebm. In 1565, he constructed the Saint George Chapel at Neiden in Norway, in what now is Sør-Varanger Municipality in Finnmark County. The small, ten square metre Chapel stands to this day, and Orthodox liturgy still is held in it every summer. Many Orthodox refugees fled from Russia to Sweden and then on to Norway after the revolution of 1917. The Orthodox Church in Russia tended to their spiritual needs through the Orthodox Church in Stockholm, founded in 1617. The Saint Nicholas Russian Orthodox Church was founded in Oslo in 1931. It was subordinate to the Patriarchate of Constantinople and was the first modern Orthodox congregation to be established in Norway. Today, the Saint Nicholas congregation has a church in Oslo and associate congregations in Bergen, Bodø, Neiden (Sør-Varanger), Stavanger and Tromsø. Most of the members of the congregations are immigrants from Orthodox countries. That said, there now are an increasing number of Norwegian members. Services are held on Sundays in Church Slavic and Norwegian, and the liturgy is held in Norwegian on the first Sunday of each month. The Saint Nicholas congregation now is one of 14 Russian Orthodox congregations in the country that together have some 4,000 registered members. Increasing mobility and job migrations in latter 20th century Europe brought about the founding of other Orthodox congregations in Norway. The Bulgarian Orthodox Church is subordinate to the Eparchy in Berlin and has two congregations, St. Kiril and St. Metodij in Oslo. It has about 200 registered members. The Greek Orthodox Church is subordinate to the Bishopric in Stockholm and has the Annunciation of the Virgin Mary church in Oslo. It has about 350 registered members. The Rumanian Orthodox Church is subordinate to the Bishopric in Stockholm and has congregations in Bergen, Oslo, Stavanger and Ålesund. It has about 400 registered members. The Serbian Orthodox Church is subordinate to the Eparchy in Stockholm and has congregations in Bergen, Oslo, Porsgrunn and Trondheim. It has about 3,000 registered members.